Others fail because of character. * They lack initiative. They don’t have what it takes. Everyone else is over it because you’re over it. This morning’s emotional outburst is ancient history. Your team loves it when you tweak their work. Others don’t see your weaknesses. If you put your hands over your eyes, that nagging problem will eventually disappear. You don’t have a problem with arrogance. Listen for excuses and blaming in your language. What comes after, “That’s because?” Is it someone else or are you taking responsibility? Just believe that we all lie to ourselves. Connect with an honest mentor, coach, or adviser. Say, “Thank you,” when you hear something that doesn’t align with your self-perceptions. ‘Go with’ before pushing back. *I first read the idea of how circumstances are the reason we fail and character is the reason others fail from “Thanks for the Feedback,” by Douglas Stone and Sheila Heen. Awesome post sir. 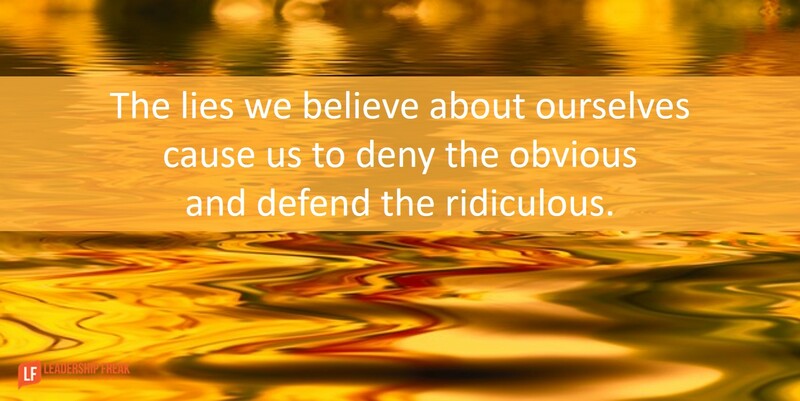 I spent 5 minuets just thinking about “the lies we believe about ourselves cause us to deny the obvious and defend the ridiculous”. Had a employ make a very bad decision last week. Have spent a lot of time in self evaluation, praying and blaming. I reached out to my mentor and we discussed how much what was going on at work may have played in his decision. As a leader we can not lie to ourselves that what happens at work does not effect employee life outside of the office. If we are not honest with ourselves what right do we have to require our employs to be honest with us? Thanks Walt. You bring an insight I hadn’t considered. We would like to think that we can serve well when our personal lives are under pressure or in disarray. One life always bleeds into the other. We can compartmentalize for a while, but not as a long-term strategy. Your idea is a great challenge to leaders. And there are so many parallels with the idea of TRUST. It can be so bad that no one even wants to talk about it, much less do it and expect it from others. All this stuff is HARD. But thanks for the post that generates the thinking and the consideration of possible alternatives. If one never thinks about these things, how can one really expect to consider doing anything differently? Thanks Dr. Scott. It interesting that knowing who we are, apart from self-deception is difficult. For some reason, your comment brought the importance of listening to feedback to mind. That is a hard thing to do. But, it is one way we might come to grips with the ways we lie to ourselves. That dance between affirming ourselves and self-deception can be weird – thanks for the reality check! Thanks Ken. You bring up an interesting tension. I wonder about feeling that we’ve arrived vs. affirmation that we’ve made progress, even though there’s room for improvement. The other thing that comes to mind is the “that’s just the way I am” argument. We might say, my short temper is just the way I am. I need you to accept me. The ‘that’s the way I am’ seems like a pretty dangerous lie. ..thanks again, I so appreciate you opening these thoughts. You are so right, the arrogant attitude that “if you don’t like me tough it is the way I am” is one of the worst lies a leader can give. That person can expect the same from their employees. It is sad that it took the loss of an employee to make me dig this deep into what I am saying and what I am doing and do they line up. Thanks Walt. One way to look at authenticity is to see it as agreement between the inner person and the outer. It includes the way we show up. Authenticity includes, “this is who I aspire to become.” For example, we might accept that we have a short temper AND aspire to self-control, at the same time. Aspiring to self-control, if we have a short temper, isn’t self-condemnation. It’s taking responsibility to show up in ways that best serve others. Thanks Dan. You have brought out a different aspect of mind altogether which many of us do not care about. We try and create a false sense of belonging and justify our acts no matter that they are pure lies. Sometimes, a leader points out what YOU might have done wrong but actually he/she is the one who previously made a wrong decision and asked you do a certain thing. The phrase that comes to mind is “But that’s not what I asked for.” whereas the notes you took during that previous meeting say otherwise. I hope you are not suggesting that the employee keep quiet and takes the blame for the leader’s wrong decision. Or are you? Thanks Amin. Great question. In public teams protect each other. That includes taking the blame with each other. I’m not encouraging anyone to be a sacrificial lamb. In private, kind candor and courageous transparency are the order of the day. All of this is to be done in a forward-facing, rather than a blaming, way. I just had to laugh. Dan, good one on sacrificial lamb. Excellently presented.